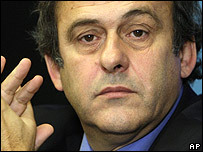 Uefa president Michel Platini has poured scorn on the Premier League's plans to play matches around the world. The former France international said: "It will never be received by Fifa, by the fans or the national associations. It's a nonsense idea. I am sure (Fifa) will never accept it because it's not good for football. "In England, you already have no English coach, no English players and maybe now you will have no clubs playing in England. It's a joke." The Premier League revealed on Thursday that it was exploring the possibility of all teams playing a 39th league match abroad, starting in 2011. Fifa has confirmed it will examine the Premier League's proposals at its executive committee meeting on 14 March. Manchester United boss Sir Alex Ferguson condemned the Premier League after claiming managers were not consulted before the plan was announced. "They should have been enquiring and having discussions with managers and players before they come out with all this stuff and make an issue of it. What do you think of the plans to play Premier League games abroad? "They can't keep their mouth shut down there," said Ferguson. "What disappoints me is Manchester United chief executive David Gill said 'keep this quiet, we're discussing it' and then it's in the papers. "These issues should be discussed internally by clubs before they come to this position we are now in but until I speak to David Gill again I have nothing more to say about it." Sunderland boss Roy Keane and Newcastle counterpart Kevin Keegan have backed the Premier League plans, with Arsenal manager Arsene Wenger broadly in favour. "I'm not against an innovative attitude if it respects the competitive side of our league, if it respects the fans and promotes the quality of our Premier League," Wenger told the BBC. 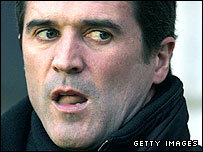 And Keane also told the BBC: "It's great. Change is good but that depends who you are playing in that extra game. If it's one of the top four, I might argue." "It will give everybody in the world a chance to see it in areas where they don't get a chance to see football like that," said Keegan. Keane added: "The Premier League has been brilliant and Richard Scudamore (Premier League chief executive) spoke brilliantly. They are looking at the proposals and do everything properly. "It's three years away and I think we should all be trying to be positive about it." Former Football Association executive director David Davies revealed his fears of player burn-out to the BBC. "It's more football when our fixture list is already more cluttered than anywhere else," Davies told BBC Radio 5 Live. Those 10 extra games would be played at five different venues, with cities bidding for the right to stage them. The extra games are expected to net the clubs in the region of an extra £5m each. MLS deputy commissioner Ivan Gazidis said there is "a thirst for Premier League games" in the USA and around the world. "If this were to happen it's something that we would be involved in," he said. "We are the premier promoter of international soccer in North America and clearly we would like to get involved." When Manchester United played a testimonial in Saudi Arabia in January they reportedly earned about £1m for the 6,000-mile round-trip. Davies added: "I would much prefer a winter break, if we want our teams to win. The problem is we neither win at international level nor do we win the big club competitions with any degree of regularity at all." "I'm not surprised about the proposal or the reaction to it for a league so popular around the world and full of players from all around the planet to want to exploit that position is entirely predictable. "Fans have got to be aware that the game has changed and the game is a global game, so there has to be a balance. "To be fair, they are not taking a home game out of the current programme and shifting it to Bangkok. The intention is to have an extra game - an extra round of matches." Professional Footballers' Association chief executive Gordon Taylor expressed concern that the plans would put more pressure on top-flight players. "I can't see it being very helpful, in a very crowded fixture programme, to introduce one more game," he told BBC Sport. "It's trying to get a quart into a pint pot, it's driven commercially. From the business side of things it will look good but you have to remember that this is a sporting business and you are dealing with human beings. "This will increase the injury problems of the top-flight players. It is going to the well too many times and it is treating players as commodities. "If you encourage caution then you are considered to be out of date but that is not always the case. "Change is not always for the better, change can sometimes affect the very strength of the roots that have caused you to be the most popular game in the world," added Taylor. The BBC's 606 website has been inundated with posts, with the majority of the 4,800 comments so far critical of the proposals and some calling for fans to unite against the proposals. The Football Supporters' Federation has launched its 'No to game 39' poll to fight the Premier League's plans.